FIFTEEN MILES north of Philadelphia, in southeastern Pennsylvania, lie wooded hills and quiet valleys. Amid the graces of this countryside rises a tower which might have been transplanted from medieval Europe. Glimpsed from a hilltop a few miles distant, warm in the sunlight or brilliantly white against gathering clouds, its buttressed lines, its lancets and pinnacles seem the remnant of a forgotten art, springing from a faith of long ago and somehow strayed into modern America. Yet though its architectural roots stand in the soil of the Middle Ages, in vision and purpose it is a creation of the twentieth century—a work dedicated to the living uses of a new Christianity. To Jesus Christ be glory and dominion for ever and ever. Behold He cometh with clouds, and every eye shall see Him. He is Alpha and Omega, the Beginning and the End. To some who look up and read this inscription against the background of blue sky and moving cloud, the Bryn Athyn Cathedral is simply an architectural work to be admired with delight for its presence in this age. Yet its architectural beauty and the unique method of its design and construction, which together have drawn countless visitors since its erection during the second and third decades of the century, are not ends in themselves. They are the result of a twofold vision that inspired the builders: to create a house of worship worthy of a new faith in God, and this by re-establishment of the architectural sincerity which characterized the churches of medieval Christianity. The Bryn Athyn Cathedral is the fulfillment of this vision; and a full understanding of its expression in stone and wood, stained glass and metal work, cannot be gained apart from the animating spirit of religious faith. Much will be said, in the pages that follow, about the works of men; it is a heartening story of human dignity and harmony. Beyond and within this, it is a story of reverence for the works and purposes of the Lord, declared not only in the inscription carved upon the tower, but by the very stones themselves, the quality of material and care of workmanship. The story of this church is one of high purpose and long perseverance, and of the joyous beauty that is their result. Bryn Athyn was founded in 1897 as a religious and educational community. It remains so today, a quiet but dynamic center of the Swedenborgian faith, a society endeavoring to practice the ideal expressed in its Welsh name, which means "hill of cohesion." Site also of the Academy of the New Church across Huntingdon Pike from the Cathedral grounds, its homes fill the slopes and valleys lying east of Pennypack Creek. The Cathedral stands on a broad knoll looking westward over the creek valley to the hills beyond. Up from the valley winds the road from the creekside, around the green hill on which the church stands. This road was laid down to serve the Cathedral's building; up its curving track toiled wagonloads of stone from a quarry opened half a mile distant. Along here, too, came materials from many other places, searched out and transported in rough form to a railroad spur at the foot of the road, to be carted thence to the Cathedral site, there to be fashioned for the building. The studios and sheds that clustered then around the church are gone; from the Quarry Road we look up past a sweep of lawn, past trees and wall and garden to the Cathedral itself. The eye is drawn to the central building—the west porch with its three-arched entrance; above its parapet, a great Gothic window of five lights; and beyond, the central tower rising into the sky. Looking upon this tower, one is tempted to think, "It is this that the substructure serves"—and that is true if one sees in its soaring lines not merely the aspiration of men, but a dedication of their endeavor to the glory of God. Finis coronat opus; the tower above Bryn Athyn gives of its strength and grace to the worship of the Lord, lifting the mind as it lifts the eyes. From the brow of the hill the full proportions of the main church building open to view. It lies, symbolically, west to east, its buttressed length culminating in a gabled and pinnacled sanctuary where the Word is kept and opened upon the altar for each service. 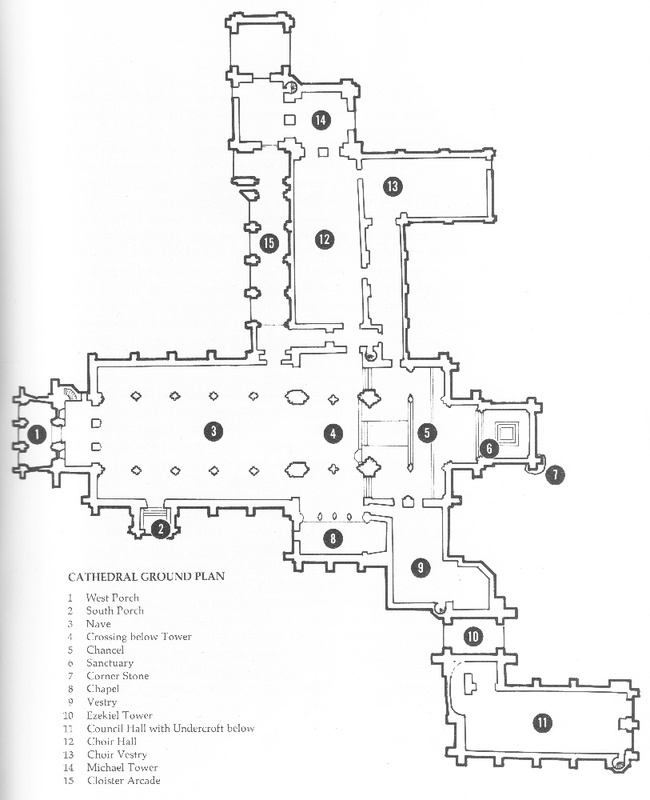 The ground plan is essentially the cruciform developed in the medieval churches, though adapted to represent the faith of the New Church. The tower rises at the crossing, and the transepts lead to groups of ancillary buildings on either hand. 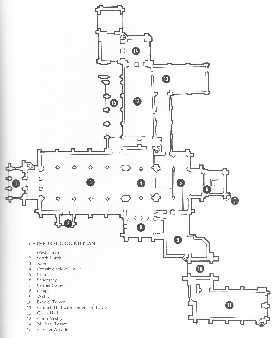 Cathedral Ground Plan. Click on image for a larger version. East of the south transept stand the Ezekiel Tower and the Council Hall. In proportion and design they reflect the Romanesque of the twelfth century, in pleasant complement to the later Gothic of the church proper, to which they are connected by the Bishop's Vestry. In the Council group simple strength is the keynote. Instead of pinnacles, we find steeply gabled stone roofs above walls massively buttressed. The Ezekiel Tower, so named from its representative carvings, stands intermediate between the church building and the Council Hall. With council chamber above and undercroft at ground level, the hall unites the strength of round arches with the upward thrust of roofline and lancet windows. Here the clergy of the General Church meet annually in council, gathering from over the continent and beyond the seas. A later chapter will treat of the detailed structure of the Council Hall and Ezekiel Tower. Let us look now to the north side, where stand the Choir Hall and Michael Tower. Growing directly from the north transept of the church, the Choir Hall—the part of the Cathedral erected last—is the simplest in line and detail. There is a quality of restfulness in the cloister arcade along its west wall, leading from the north entrance of the church to the Michael Tower which terminates it and is balanced on the north side by a porte-cochere. A walk along the east lawn will complete our general view. The eastern side of the Cathedral is varied in depth and perspective, with unexpected delights at every pause. The vestry wing of the Choir Hall lies to the east at a right angle. Yet "angle" suggests a mechanical hardness that is wholly absent from the scene before us; even the simple lines of the Choir Hall decline to grow rigid. This is partly the effect of proportion; but another cause lies in a feature of design wellnigh unique among modern buildings. This is the use of refinements in the form of curves and other departures from straight and parallel delineation. They have been so delicately introduced that the eye and mind may appreciate them unconsciously; but an example may be readily noted from the northeast lawn in the rising curve of the Choir Hall roofline against the western sky. These refinements will be given detailed consideration in a later chapter. The east end of the church building is the focus of worship within. From the outside the sanctuary continues, on a smaller scale, the lines of chancel and nave. Its great window to the east stands between strong buttresses, and the entire southeast corner rests on an unhewn cornerstone as symbolic foundation. On a lower level, beyond a magnificent hedge of boxwood, the Ezekiel Tower and Council Hall come into full view. From the lawn above, they appear to be set apart; but standing by the Roman arches at the east end of the Council Hall, we see exemplified the essential quality of all enduring art—the unity that arises from the harmony of strongly individual parts. Unlike the north end, here is not simplicity but a vibrant ordering of planes and lines, window-arch and cornice, gable and buttress, parapet and pinnacle. Here can be seen the truth of the phrase, "Architecture is frozen music"—save that "frozen" suggests a coldness denied by the warmth and variety of color and line. "Caught music" rather, a harmony of many individual notes, a symphony in stone, with motifs repeated and varied and interlaced, sweeping in crescendo to the tower above—a psalm of praise to Him who created the earth on which it stands.